Words that so aptly describe the sight and sound of a highland piper performing a lament during the funeral service for a departed loved one. It is a scene that has been repeated countless times throughout the centuries whenever Scots have come together to pay a final tribute to the lives and deeds of their dead, and their iconic instrument, the highland bagpipe, is most especially suited to this task. It has been theorized that this is due to the nature of the bagpipe's ancient pentatonic scale which allows for such beautiful and mesmerizing harmonics....... but the truth of the matter is that no one really knows why this music moves people in the way that it does. The only thing that is certain is the affect this haunting music has on virtually all who hear it, regardless of their ethnicity. A qualified and experienced piper has the ability to cast a spell over a gathering, and to invoke therein the most intense feelings of poignancy and remembrance. 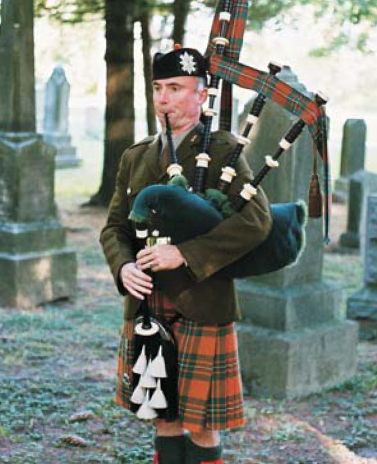 There is no doubt that the music of the highland bagpipe strikes a deep and resonating chord in all who hear it, and it is for this reason that the tradition of pipers sounding laments at funerals has survived to the present day. 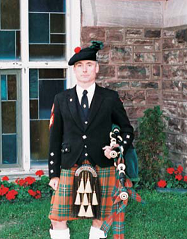 As a professional piper, Mitchell McDowell is acutely aware of his connection with the past, and as a musician he takes his craft very seriously. For more than thirty years, it has been his privilege to assist families in bidding a final and dignified farewell to those they hold dear. Through his music, be it in a chapel or at the graveside, he has enabled others to express their feelings in a way that perhaps no words ever could........for it is the very nature of music to speak in ways that words cannot. As every professional musician knows, when it comes to a public performance careful preparation and meticulous attention to detail are the keys to success. When the performance venue involves a funeral service, preparation, punctuality, and uncompromising attention to dress and deportment are absolutely crucial, and Mitchell McDowell holds himself to the same high standards expected of every other professional involved in an official capacity on such a solemn and important occasion. The death of a loved one and the planning of their funeral are among the most stressful experiences we will ever encounter in life, but trusting in the abilities of professionals at such a time can help to relieve some of the burden. Mitchell McDowell knows that there is no such thing as just another funeral. Each is a truly momentous event filled with emotion, and he can be relied upon to honour the trust that has been placed in him each and every time, without fail.